If you read magazines or browse men's style sites you get the impression that a decent briefcase has to cost the same amount as a suit. 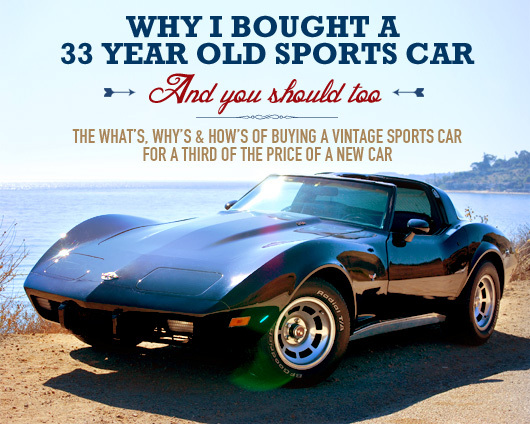 We found one that looks great, is built tough, and comes at a decent price. The need for a briefcase sneaks up on every man. A guy may never even think about needing (or wanting) a briefcase, and then one morning – as he gets ready for an interview, his first day at a new job, grad school, or other professional endeavor – he realizes he has nothing to carry his gear and paperwork in except for that bag from college. And he's also surprised how much stuff he has that he needs to carry. Laptop, a manual or two, iPad for the commute, the stack of documents from HR, sunglasses, pens, gum for the post-Garlic bread lunch meeting, and the list goes on and on and on. Unfortunately what most men also discover is that there isn't a great selection of briefcases that are modern, classy, AND in a post-college price range. The low end of the price spectrum is full of messenger bags that either look like you're hauling the laptop case that Best Buy threw in, or you're a San Francisco bike messenger. On the other end are some awesome briefcases like Saddleback Leather or Filson, and are worth buying when, you know, you can spend a few hundred dollars on a briefcase. Fear not, gents. I've found a briefcase that looks great, will last, and is decently priced. It's from an English company called Knomo (Knowledge & Mobility) that has designed a beautiful case, with modern touches like the cool blue interior and padded wall to keep your tech safe. 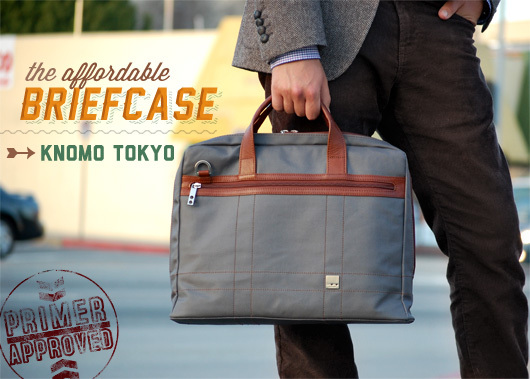 The Tokyo Briefcase is constructed out of treated canvas making it waterproof from all your spilled coffee, wet floors, or whatever else life throws your way. It has strong leather handles and built to last. I've been carrying it for over a month on a daily basis. It not only has shown its durability (its got a 2 year warranty), its organization options have consistently impressed me. 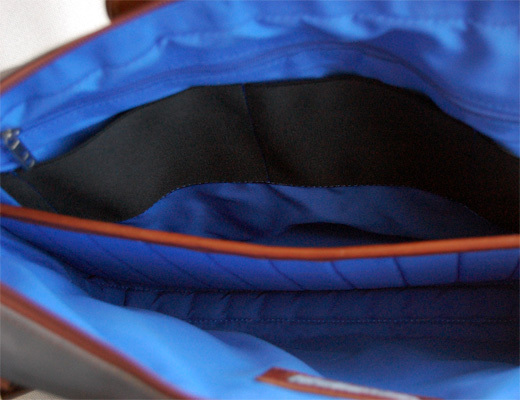 3 stretchy pockets to stuff your phone, headphones, card case, Magic Mouse, etc. My problem with most messengers is they not only lack structure, the only way to carry them is with the over the shoulder strap. 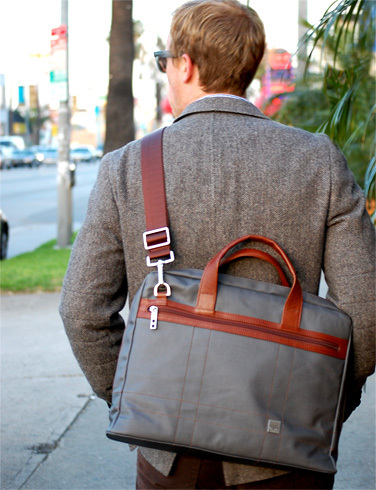 The nice thing about the Knomo briefcase is that it has its normal briefcase handles, but also comes with an over the shoulder strap you can haul along if you've got a distance to hike or need your hands free. Knomo also has a cool perk to registering your bag. Each bag has a tag sewn in the inside with a unique serial number and Knomo contact info. If a samaritan finds your bag and contacts Knomo, they'll get it back to you. The Tokyo as shown in my photos goes for $134 on Amazon. But, they offer a brown and black version that's on sale right now for only $90. Check out more info on Knomo's site. This is a great find Andrew! I’m a real fan of briefcases and have about 4 right now on a steady rotation. Although it’s really not necessary for the type of career I’m in, I get compliments every week. This one I’m picking up! Different from the rest, the price is right and the quality looks great. I just picked up a saddleback but I might pick this up as a second bag. Your $90 link doesn’t work and it looks like they only have black and grey. Looks like the brown one is sold out on their site now, but if you go to the Amazon link it’s still available for $90. The one on Amazon doesn’t have the brown accents and doesn’t look as nice as the one in your pictures. Do you know if the one you have is different than the $90.00 dark brown one on Amazon? I like the look of the brown trim on yours more. Mine is the Gray, which is on Amazon at the same link (choose a different color) for $134. The brown one is on sale for $90. is that the LEC herringbone blazer? also what shirt is that? Jake, Yep it is. The shirt is a purple check from Gap. How does this compare quality-wise to a filson 256? I’m considering this but would like to buy something that will grow patina and not just fall apart. I don’t like the filson color palette and would prefer grey or black, but only if the quality is comparable. Does this really make for a good, long-lasting, roomy work briefcase? The link states it as being a laptop bag. Old post, but does anyone know where one of these can be located? All I see on amazon are the matte black ones. Looking like a bike messenger is actually a large part of the intention for most people, especially here in SF (and a reason why so many messenger bag companies are located here). A lot of those people also do ride bicycles (like myself) where a briefcase is awkwardly impractical. The only people who don’t are typically messengers who often don’t carry the same brands that tend to be popular with non-messengers due to different needs.